It's been a rainy weekend here in South Florida as we await Tropical Storm Isaac. We definitely had a lazy day in my house which I thoroughly enjoyed after the rush of the first week back to school! I don't know if it's the cool, wet weather or the feeling that fall is at our doorsteps, but comfort food seemed to be in order tonight for Sunday Dinner. I've had a week full of cooking heavier, meaty dishes - rabbit, beef bacon, turkey and lamb - so the only thing I plan to eat for awhile is seafood and vegetarian meals. 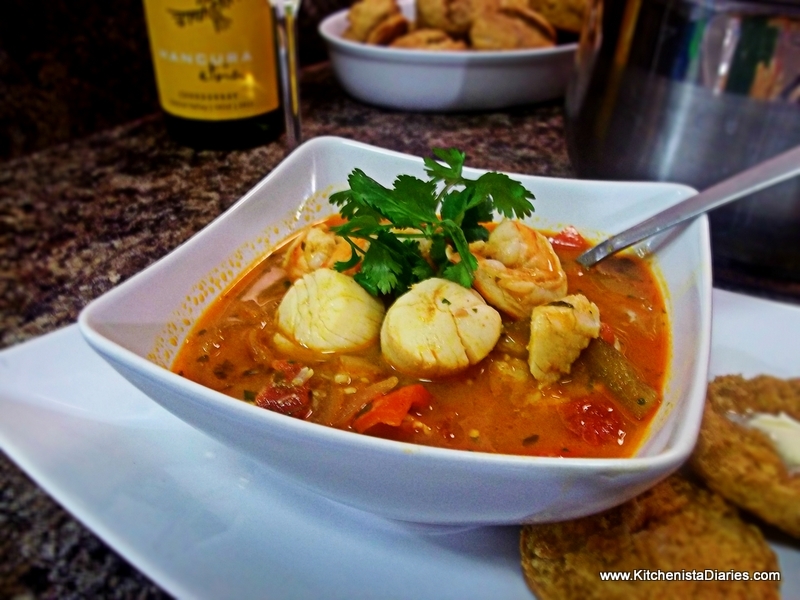 Ever since talking to a good friend of mind about the fish stew she prepared last week, it's been on my mind. 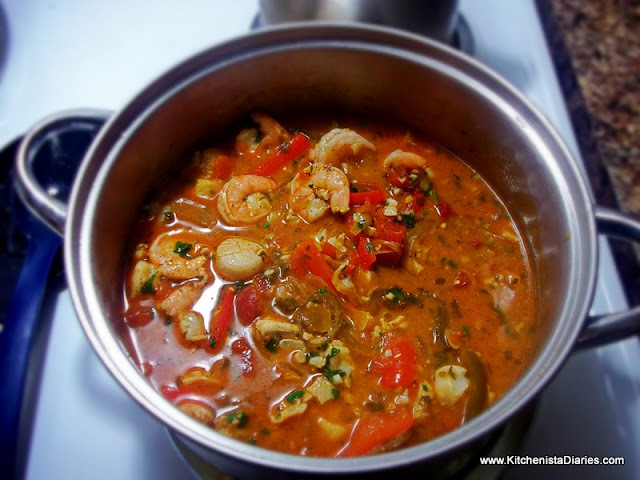 I love a good fish stew and lean towards those prepared Spanish-style with a tomato base, so I took elements from various stews I've had or wanted to try and made my own version. What I liked about it was that even though it filled us up and packed a ton of flavor, it wasn't a heavy dish at all. I rarely eat soups or stews in the summer, so this was a treat. I purchased cod, shrimp and scallops as those were the best deals at the seafood counter today. You can substitute any meaty white fish or even salmon. If fresh seafood isn't an option, thawing a bag of frozen mixed seafood can be economical. Our grocery stores here sell $5 bags of shrimp, mussels, squid and scallops that would work perfect in any fish stew. To finish off this zesty, healthy Sunday Dinner, my son helped me make sweet potato biscuits, coconut brown rice and sauteed zucchini. Dinner came together nicely and definitely brought us some comfort on this rainy summer evening. For all of my readers in Isaac's path, be safe out there tonight and in the coming days! The best way to cook a flavorful stew is by building flavors slowly and allowing the broth plenty of time to simmer. I started this one by cooking sliced onions in coconut oil over medium heat. You want these to get soft and translucent as they start to brown, approximately 10 minutes. While the onions cooked, I prepped my remaining veggies. 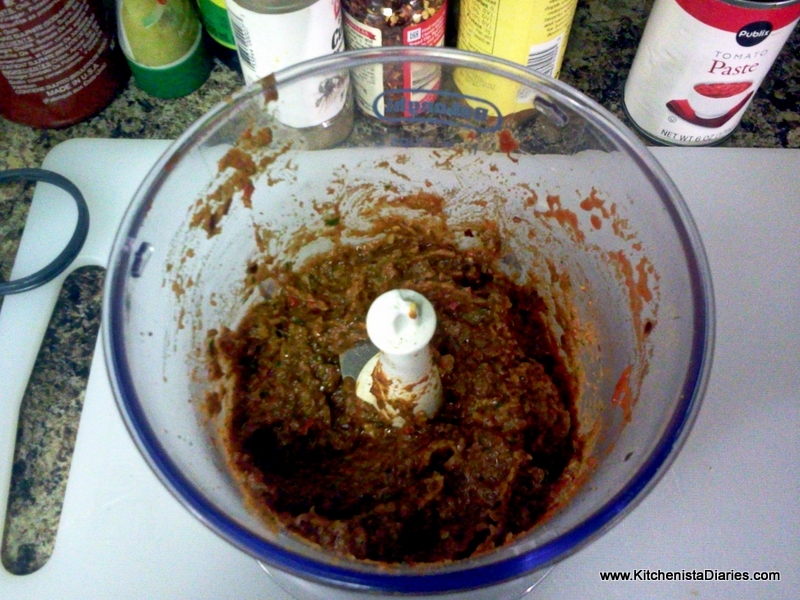 The minced garlic and ginger can be added to the onions and cooked a few more minutes until fragrant. Add the peppers and jalapeno to the pot and continue to cook until peppers are crisp tender, 3 - 4 minutes. Season with coriander, smoked paprika, cumin, salt and pepper. Add the clam juice, chicken broth, and tomatoes. Stir to incorporate the seasoning into the broth, scraping up any browned bits of garlic and ginger at the bottom of the pot. Add some chopped cilantro and parsley. Reduce heat to low and simmer at least 30 minutes. If you are making the stew ahead of time, now is a good time to stop. The seafood should not be added until just before serving, so the broth can be reheated when you are ready to finish the stew. Chop up the fish into bite size chunks. Add to a bowl with the scallops and peeled shrimp. Squeeze one of the lemons over the fish and season with a good pinch of coriander, cumin, cilantro and parsley. Toss lightly and set aside. I almost always buy shrimp with the shells still on because it saves me a couple dollars per pound. Another great thing about that is the shells add a ton of shrimp flavor to your broth. After rinsing them off, place them into a small sieve, and then dip the sieve into your broth so that the shells cook in the liquid. Simmer for a few minutes until the shells are pink, then remove the sieve and discard the shrimp shells. Increase heat to medium low. Finish the broth by adding the white wine as well as the juice and zest from the remaining lemon. Allow to simmer for a couple minutes. Now is an excellent time to pour yourself a glass of wine if you haven't already! The seafood should now be added by order of what takes longest to cook. In my case, I added the cod fish and allowed that to cook until the fish was opaque, about 5 minutes. 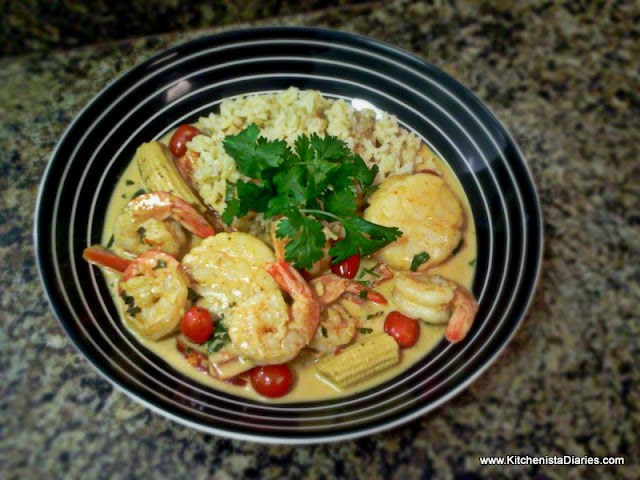 Next I added the shrimp and scallops and cooked another 3 - 4 minutes until the shrimp was pink. I seasoned to taste with just a pinch of salt. Turn off the heat, toss in some extra parsley and cilantro, and serve immediately! The great thing about stews is the ability to finish some simple side dishes while the main dish cooks. I let my son help make a pot of my Coconut Brown Rice, and we also made some delicious sweet potato biscuits using baked organic sweet potatoes. I veganized this biscuit recipe by substituting coconut milk and shortening for the buttermilk and butter. We also added a touch of cinnamon. They were subtly sweet, tender and Jaden devoured them, so I'm going to continue to work on the vegan version to post for The Kitchenista Diaries soon! At the last minute I decided we needed some green veggies on our plate so I let my son choose. He asked for sauteed zucchini, which was a great addition to the menu. So about 10 minutes before dinner was ready, I quickly sauteed some sliced zucchini in coconut oil, adding lemon juice, cilantro, parsley, sea salt & pepper. The soup was perfect with a scoop of coconut brown rice! I debated adding coconut milk to my broth for this recipe, and ended up leaving it out. I liked how the rice added a hint of coconut flavor without making the stew too rich as the coconut milk probably would have. How gorgeous is a fresh piece of raw tuna? The deep red color of the flesh is even more enticing to me than salmon, unfortunately the price is rarely in my budget! 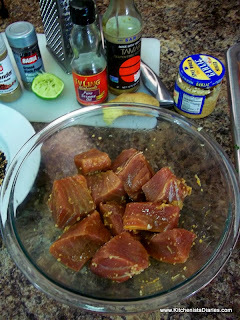 Luckily I came across a great sale and scooped up a pound of fresh Yellowfin tuna chunks for $6, making this an affordable light dinner for me and my son. Keep an eye out for the occasional sale at your seafood counter or look for flash frozen tuna steaks that can be thawed at home. Tuna gets a bad rap these days and for good reason when it comes to sustainable fishing or mercury contamination. That said, tuna is an awesome source of Omega-3's and Vitamin B, so don't count it out as part of a healthy diet. This article from SmartyPants has some great tips on what to look for when buying tuna, what types to avoid and how to store it once you get home. Way before I ever got on board with sushi, I remember the first time I had seared tuna at a restaurant. 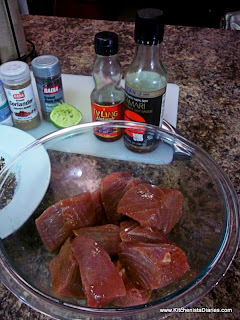 After the initial fear of dying from eating raw fish, I quickly realized how incredible rare tuna tastes. I also realized that the reason I'd never enjoyed tuna steaks before was because they had all been cooked beyond recognition, resembling a dry, tasteless gray hockey puck. Maybe that's why I used to be a little intimidated by cooking it at home, which is funny because it turned out to be one of the easiest kinds of fish I cook. The trick is just keeping an eye on the time (I find that counting the seconds myself is easier than working with a timer for something this fast.) High heat is essential to get a nice crust on all sides, and removing the tuna immediately from the pan prevents it from continuing to cook before you serve it. 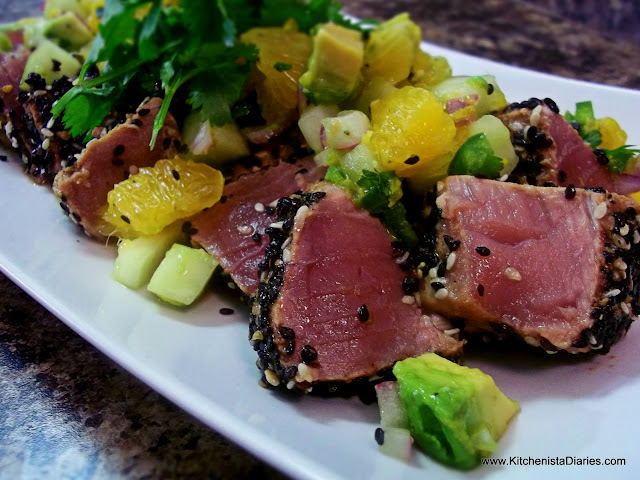 I served my tuna chilled, topped with a fresh citrus summer salsa of oranges, cucumbers and avocados dressed in a simple splash of lime juice and seasoned rice vinegar. From start to finish, the entire dish takes less than 30 minutes to put together and requires virtually no measuring. Have fun with this and enjoy a refreshing summer treat! Rinse off the fish and pat dry. Season with a splash of rice wine vinegar, splash of soy sauce, some grated ginger, a little garlic, the juice of one lime and a drizzle of sesame oil. Gently toss to coat fish and return to the fridge until needed. 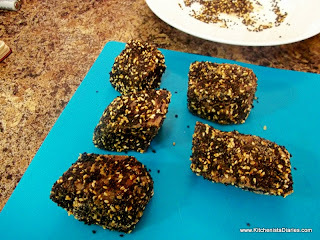 In your pan, dry toast some sesame seeds for a couple minutes over medium heat. Enough seeds to cover the bottom of the pan is more than enough. 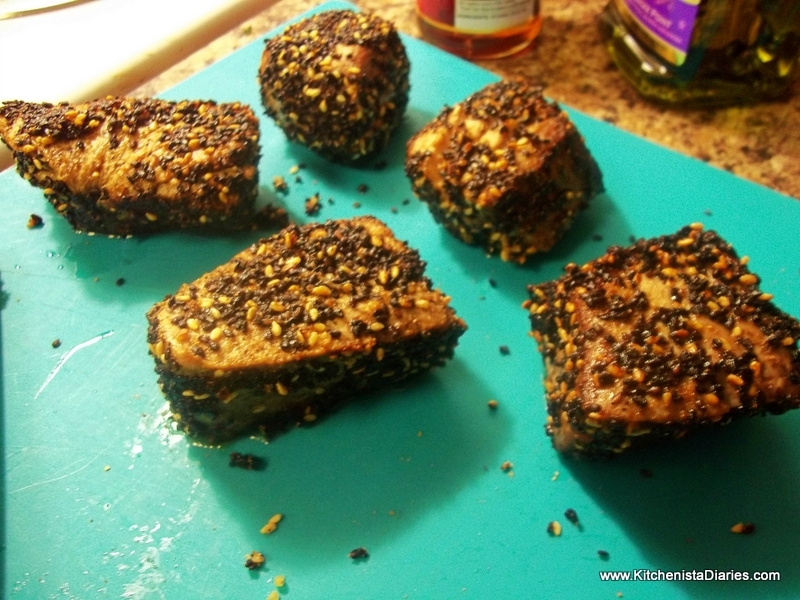 As they toast, you'll see the white sesame seeds turn a light golden brown and start to smell the sesame fragrance. Remove from pan and transfer to a plate. 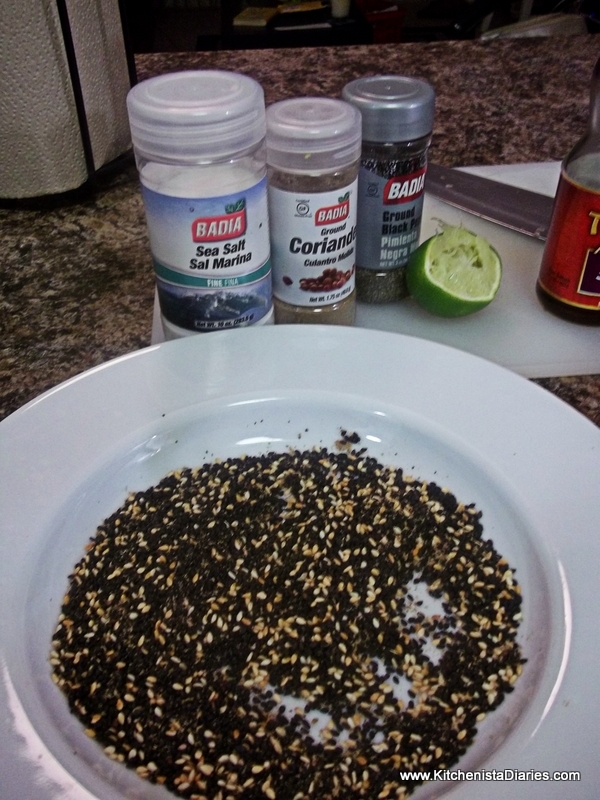 Add a pinch of sea salt, some black pepper and a couple pinches of coriander to season the sesame seed mixture. To prepare the salsa, you'll need to peel & chop up an orange. The best way to do this is using a knife to slice off the orange peel and trim off any remaining pith. 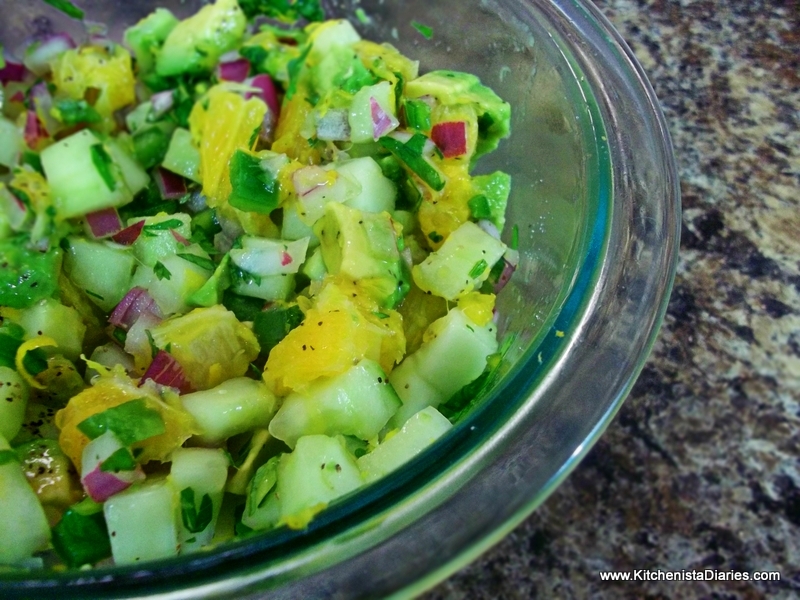 Combine the onion, cucumber, jalapeno, cilantro and oranges in a small bowl. Add the lime juice and a splash of rice wine vinegar. Cucumbers release quite a bit of moisture so 1/2 a lime should be enough. 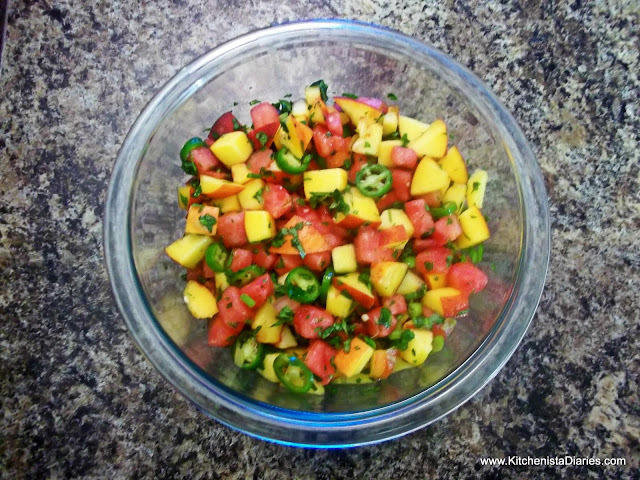 My tip whenever making an avocado salsa ahead of time is to mix all of the ingredients first, return to the fridge and wait until just before serving to add the diced avocado. Stir gently, trying not to mash the avocado pieces. Press each side of the tuna chunks into the seasoned sesame seeds to form a crust. Set aside while waiting for your skillet to get hot. Over high heat, warm some coconut oil. 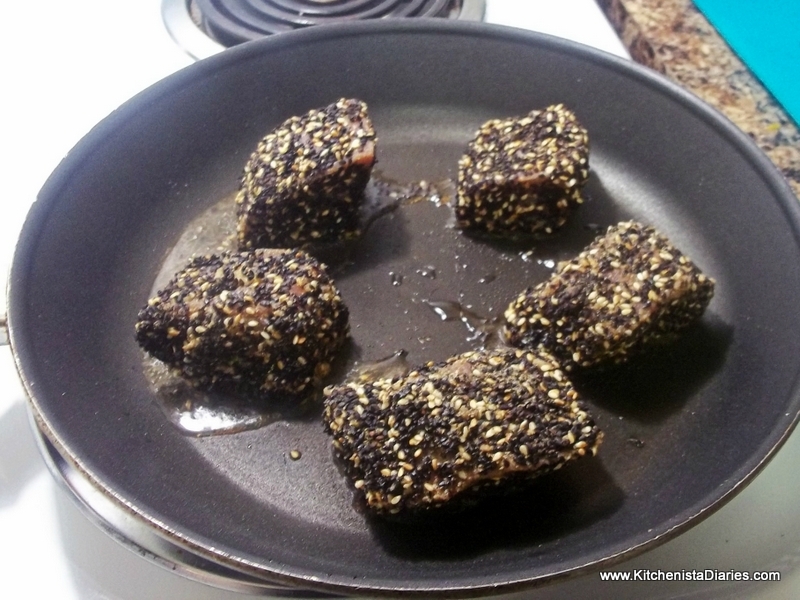 When oil is hot & shimmers, add the tuna chunks to the skillet. 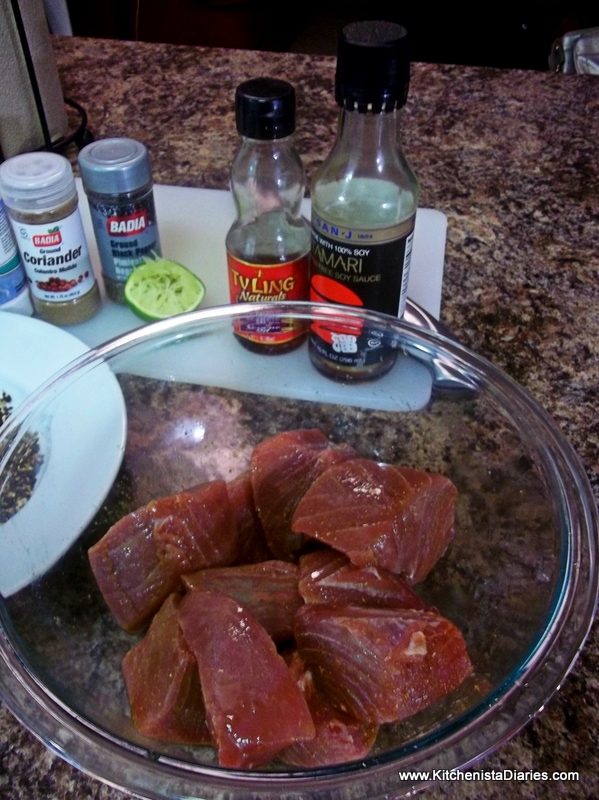 Allow each side to sear before rotating to the next side - approximately 1 minute per side for rare tuna. I place tuna into the skillet one by one in a clock-wise circle, this makes it way to monitor cooking time as I rotate around the pan to flip them in the same order. 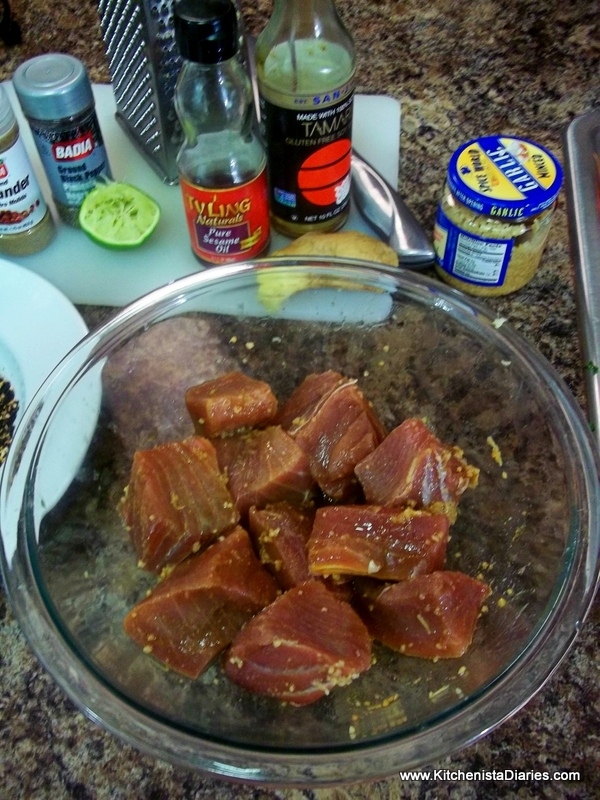 As soon as all sides have seared, immediately move the tuna from the skillet. The tuna does not need to rest before slicing and you can serve it hot. However, I prefer my tuna chilled so I put it in the freezer for a few minutes while getting my plates ready. 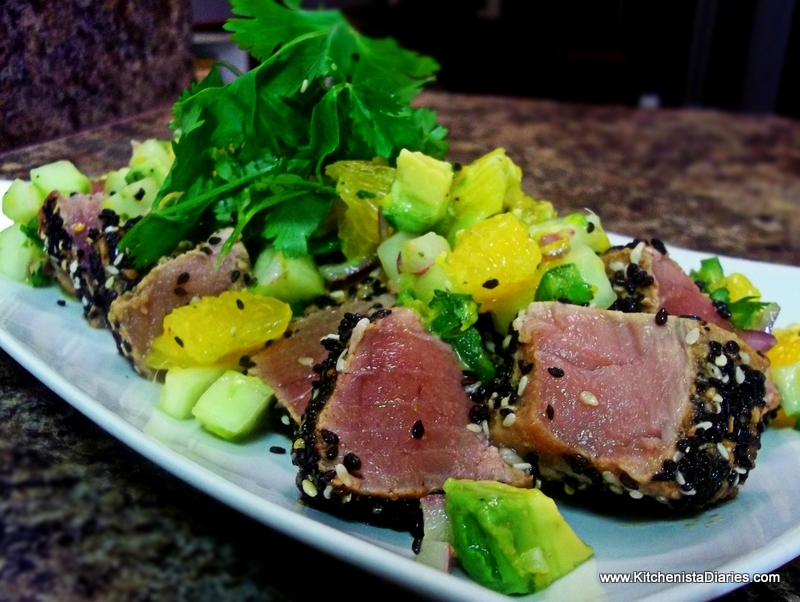 Sliced seared tuna topped with the orange, cucumber & avocado salsa, garnished with cilantro leaves...delicious! Give me some fresh veggies, a good coconut curry sauce and sticky brown rice, and I'm a happy girl. It doesn't really get any easier than this to make a ridiculously easy - yet impressive - vegan dish. This is a red curry sauce utilizing the fresh red curry paste from my previous post, however you could use your favorite store-bought paste. Just know you're breaking my kitchenista heart. Kidding...kidding. 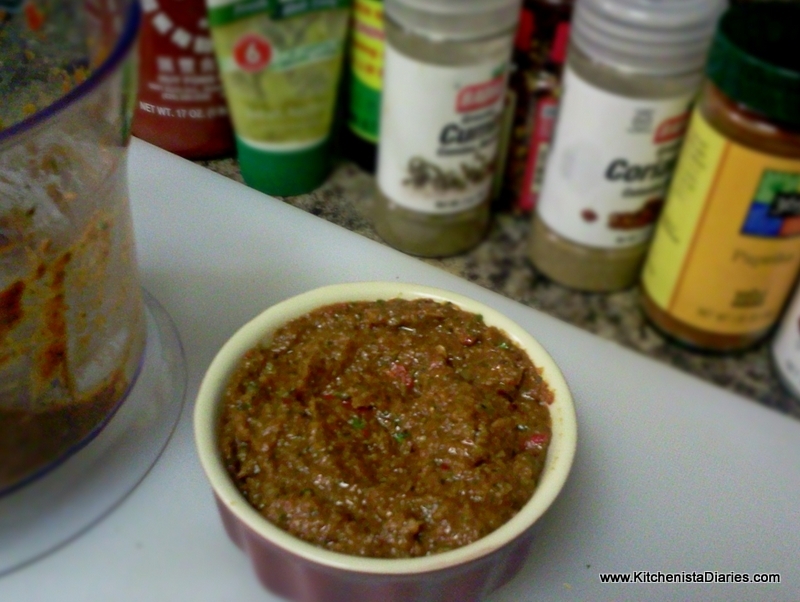 All jokes aside, make sure you are getting a vegan red curry paste, as many have fish sauce as an ingredient. 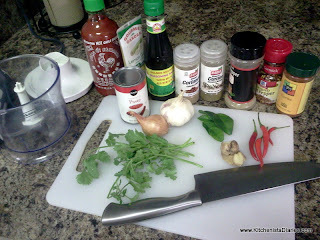 I use Golden Mountain Sauce as a substitute in my curry paste, available in most Asian markets. I often write about my attempt to branch out and use new ingredients as much as I can, so this time it was okra. They looked so green and fresh at the farmer's market, I couldn't resist picking up a carton. For $2, it was well worth taking a chance. Before you scrunch up your face in protest, I too am leery of the okra slime factor. I have only had non-slimy okra a couple times but it was fried beyond recognition in a thick breading, which is such a terrible way to treat vegetables isn't it? So to make sure I was going to like it, my first trial of okra cooking involved a very simple roast w/ just a drizzle of olive oil and a pinch of sea salt. Perfection. I could have eaten the whole carton just like that. I figured something similar would work in a curry dish, so I decided on a quick pan fry to yield crispy skin minus the slime factor. Did you know that a cup of okra has just 30 calories and comes packed with fiber, calcium, and Vitamin K? I'm telling you - get on board with okra! Because eggplant taste best when they are cooked just long enough get crispy on the outside and creamy inside, I also pan fried them prior to simmering in the curry sauce. I find Chinese eggplants to be an easier shape to work with and just a tad bit sweeter than other varieties, so they are my preference in stir fries and curries. The end result was crisp tender veggies that retained their flavor and texture in the sauce. 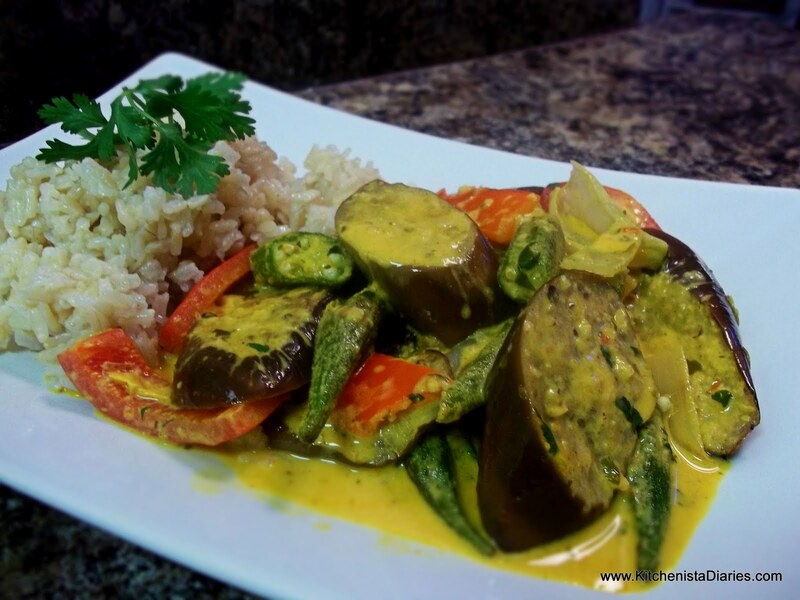 Okra and eggplant have surprisingly similar tastes, so they worked well together in the curry. I was happy with this dish. 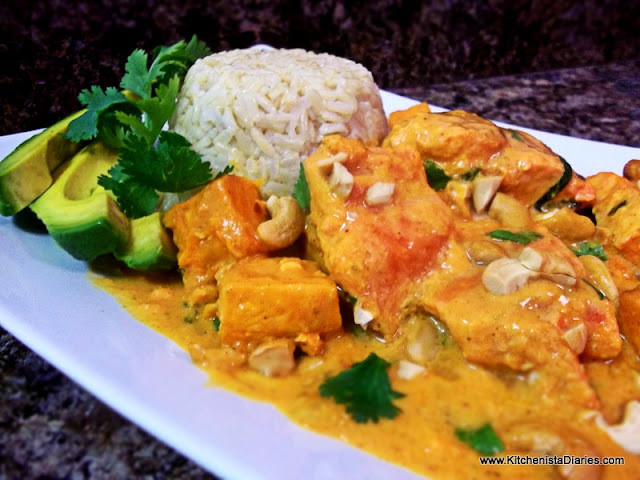 Spicy but not overwhelming, rich in flavor and nutritional value. Once you get used to eating like this, Meatless Mondays quickly become a dinner night worth looking forward to! Much like cooking stir fry dishes, it's important to have all of your ingredients and equipment prepped and ready to go before you start cooking, as the process moves rather quickly. In French this is known as "mise en place" and is in my opinion one of the most important aspects of cooking, regardless of cuisine. Over medium high heat, melt a tablespoon of coconut oil. I use a wok for much more than stir fry, so you'll see that a lot in my recipes. They're great for large rice and pasta dishes too. Add the okra and cook until crispy and just beginning to brown, 2 - 3 minutes. Remove with a slotted spoon to drain the oil and set aside. Pan fry the eggplant until it just begins to turn golden brown, 3 - 4 minutes. Remove from the wok and set aside. If necessary, add a little more coconut oil to the pan. Eggplant tends to absorb it all. Saute ginger and garlic until fragrant and add the sliced onions. Cook until onions soften, 1 - 2 minutes. 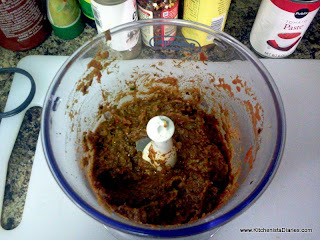 Add the red curry paste and cook until the onions are well coated. Use your best judgement on how much to use as the spiciness of red curry pastes varies widely, even in using my homemade recipe. 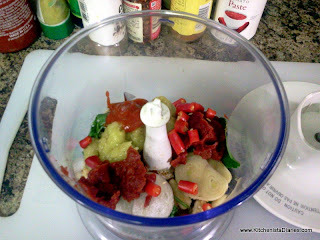 Add the red bell peppers and cook until crisp tender, 1 - 2 minutes. Slowly pour in the coconut milk, vegetable broth and lime juice. Gently scrape up any browned bits in the pan. Bring the sauce to a boil and then reduce heat to low. Return the okra and eggplant to the wok. Gently toss in the curry sauce and simmer for 1 -2 minutes. Serve hot over cooked brown rice.